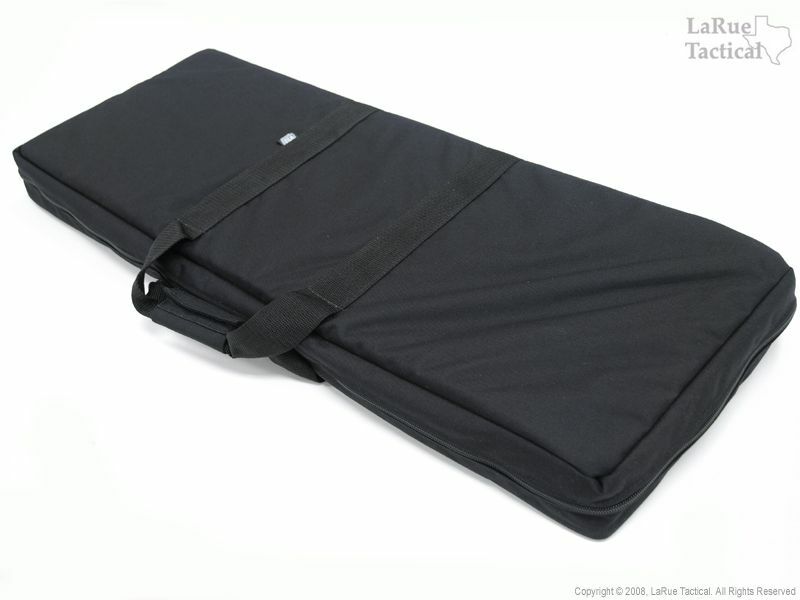 Our discreet soft case designed to fit a hard case for air-travel. We've added some improvements to our standard discreet case. 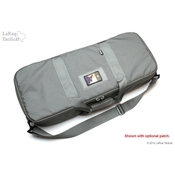 A padded sling, extra MOLLE strips, shallower mag pouches, sturdier construction and additional stitching are a few of the improvements. 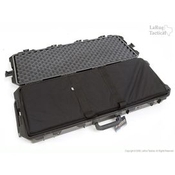 This case fits fully-assembled AR-type rifles up to 16 inches in barrel length (with collapsible stocks). 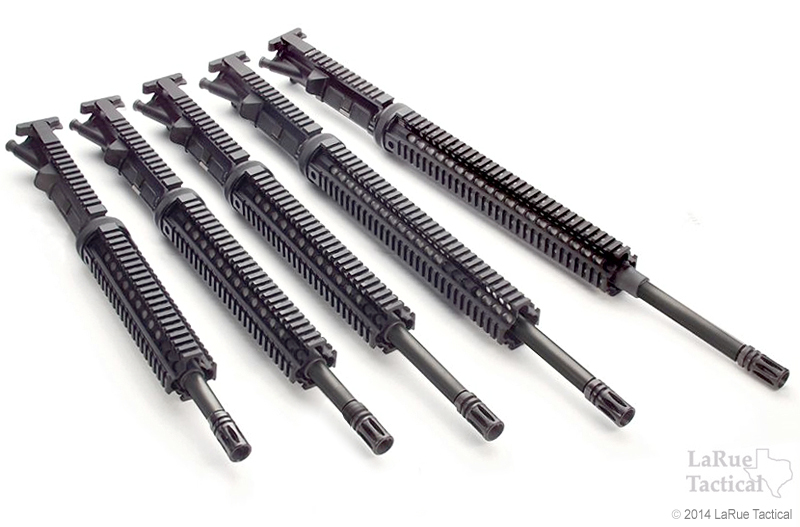 Larger rifles can be broken down and transported in sections, secured to the additional MOLLE Strips. 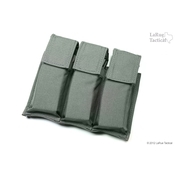 The extra MOLLE strips are also great for small cases, holsters, etc. 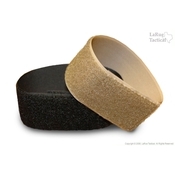 The removable padded separator protects your weapon from rubbing the magazine pockets and additional gear stowed on the other side. 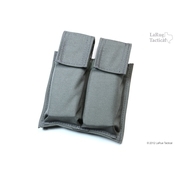 Five integral magazine pockets hold 20 or 30-round AR mags, keeping them at reach. 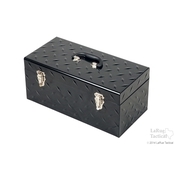 A zippered 8 ½" x 7" security pocket holds paperwork, manuals, small targets, keys, etc. 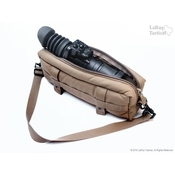 with added MOLLE webbing to attach extra mag and utility pouches. 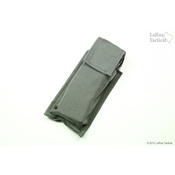 A zippered 5 ½" x 7" widowed pocket is perfect for range permits, ATF forms, etc. 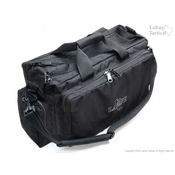 The exterior has dual-zippered closure, with built-in handles that have a Velcro roll-over flap, for fatigue-free carrying of heavier loads. 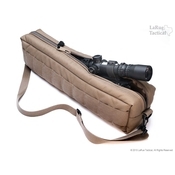 The comfortable 2"-wide adjustable shoulder strap extends from flush, to 48". Got the M.O.A.B along with the Tactical Improved Discreet Soft Case. They're made of pretty good quality and both are a perfect fit for my IM3100 and IM3200 Pelican cases. Got some awesome stickers and goodies as well as a couple copies of the Constitution. Great morale material especially for someone living in the People's Republic of California. LaRue cases are just as impressive as their weapons. 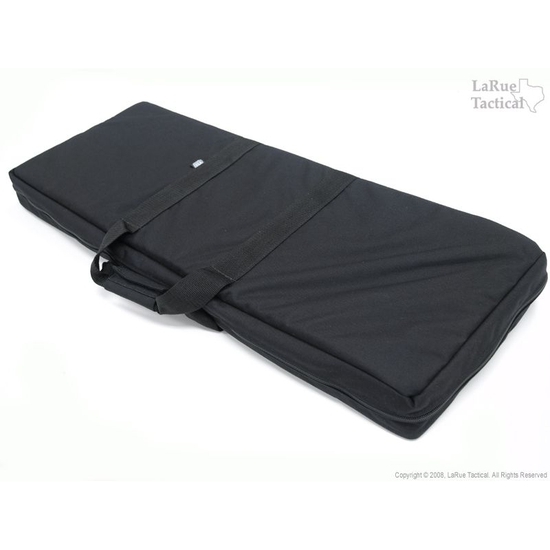 The case is made in the USA, very durable, has plenty of pockets for your gear (on the inside, it is a discreet case) and will hold a carbine perfectly. 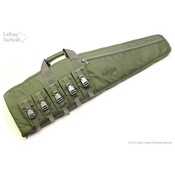 Has a nice divider between your rifle and the pockets. If you are on the fence about spending this kind of coin have no qualms, it's made to last! 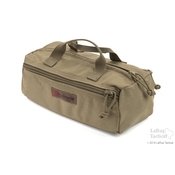 I have a couple different cases sold by LaRue and they will take a beating. 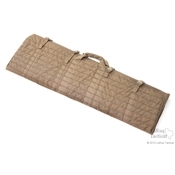 I purchased the TIC Soft Case because I needed a better way to transport my AR-10 hunting rifle. Putting it the back of my SUV fully assembled with its suppressor invited to much attention. I have a hard Pelican Case for the fully assembled rifle but it plus the rifle weighs 30 pounds!! The LaRue case appeared to be perfect and it is. It took about 30 minutes moving all the different parts of my dis-assembled rifle (4 pieces) around to find the best configuration and install the MOLLE straps but once done everything is held solidly in place. The pockets on the other side of the divider hold 2 magazines, my Harris bi-pod, my mono-pod and tactical compensator, and my bottle of gun oil. The suppressor permit, hunting license and ammo ballistic cards go in the pockets. Best of all it is discreet and I can pick the whole thing up without busting a gut! 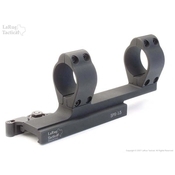 Another great product offered by LaRue. I like that it fits into the Storm case for travel. And that it is very high quality and made in the USA. Would be better, however, if the MOLLE webbing where the rifle mounts covered the entire side rather than just the middle 50%. Velcro covering the center divider would be great, too. other than those two recommendations I love the bag. Fantastic case. Since I've owned the case it has traveled everywhere with me holding my rifle, mags, and maintenance supplies. Just what I was looking for. LaRue's service was fantastic as usual. 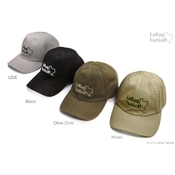 If there was a drawback to this transaction it is that I did not receive a LaRue cap :-) If you need a soft case option, this is the one. Add the Storm case and it has no peers. Great case, well made. Lots of room for mags, supplies, tools, etc. Fits my Bushmaster quite well. Superlative case that doesn't scream "Hey, there's an AR in here!". You can carry it around like you're an artiste out for a day of painting with your canvas and easel tucked away inside. Only you're not. You're an American Badass that likes to be discreet. 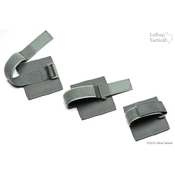 Build quality is excellent as can be expected from LaRue as are the many practical features to be found once you unzip it. 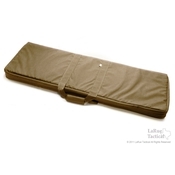 A padded divider ensures your rifle and optics are protected while the other features (count 'em) five mag pockets in case the crazies show up. I've also just ordered the Storm iM3100 to go with it. It's backordered so it must be pretty darned popular. No, you can't have mine. Get in line. This is a great case which handles my necessary mags and M4 along with attachment points for additional pouches. A super purchase. This is a great soft case. 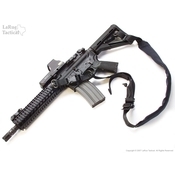 Holds a single M4 with some accessories or two SBR's and some small items. Mine is a daily use bag holding my duty carbine. Combined with the Storm case, makes for an unbeatable combination to transport and protect firearms in the back of my squad car, 4x4, ATV etc. 55 out of 104 people found this helpful.